Special needs bikes can enable thousands of people with physical limitations to enjoy cycling. The term “special needs” when applied to cycling can encompass everything from simple balance issues to paraplegics and a lot of in between issues like back problems, weight problems, limited flexibility, vision and hearing impairments, and even more complex problems like Downs Syndrome. Often people that are dealing with these issues do not get enough exercise and special needs bikes can do wonders to enhance their physical and social well being. Anyone that has ever seen a competition of physically challenged athletes can’t help but notice the pride and sense of self worth on the faces of the participants. The physical and social benefits can be tremendous. This doesn’t mean that everyone can ride but it does mean that thousands of people with these challenges can enjoy cycling. And they can get some great exercise with the right equipment or in company with a friend or caregiver. As with any physical activity this should always be undertaken with the blessing of a medical professional. Simple balance issues can be addressed very easily with a three-wheeled tricycle or recumbent. Step through bikes or tricycles are great for cyclists with limited flexibility. The unique design of the buddy bike lets the child enjoy the cycling experience but keeps the adult in control at all times. No more worry about how your child is doing behind you. 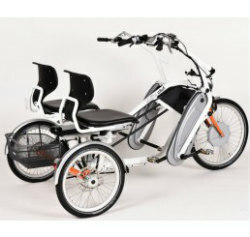 A semi-recumbent tricycle is a great choice. The backrest and pedal forward design are great for riders with back problems. A side by side tandem recumbent is an awesome way to share the riding experience with another. The passenger can even choose to peddle or not with the independent pedaling system. The seats are fully adjustable and have seat backs for maximum comfort. Cyclists with hearing or vision impairment often ride as the stoker (rear rider) on a tandem or side by side on a double tricycle. Paraplegics often ride recumbent or semi recumbent hand-cycles. They are an awesome tool for building upper body strength and fun to ride. Quite often it really is a case of where there is a will there is a way.